EXCURSION: Donning white helmets are Dave O'Dwyer (left) and Stuart Green from New Acland with a delegation of Mongolian journalists overlooking the mining pit. NEW Acland's progressive rehabilitation has drawn international interest. 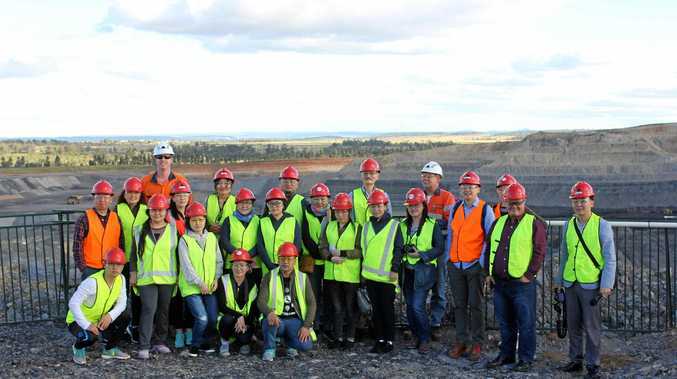 A delegation of Mongolian journalists visited the mine during a tour of the Darling Downs with the University of Queensland. Made up of economic and business journalists, the delegation was on the final leg of a four-phase training package with the university aimed at improving coverage of sustainable mining development in Mongolia. Mine operations manager David O'Dwyer welcomed the delegation to the site along with the university's deputy director of sustainable minerals institute Robin Evans and school of communication and arts lecturer Bruce Wooley. Mr O'Dwyer said the journalists arrived with a thorough understanding of the mining process. "This allowed us to delve deeper into our innovative work with our hybrid mining truck and our use of recycled waste water in our mining operations," he said. "They were interested in learning about our progressive rehabilitation techniques and we got to explore some of New Acland's fully rehabilitated areas which now total over 430 hectares." Mr O'Dwyer said the rehab section of the tour was the most popular part. "Although I think that may be thanks to our local kangaroo population hopping by for an unexpected photo opportunity," he said. The training program was a joint initiative between the University of Queensland and the German Federal Government's Integrated Mineral Resource Initiative. Learn more about the university's work with the journalists by visiting hass.uq.edu.au/article /2016/09/uq-delivers- specialist-journalism- training-mongolian -reporters. Find out more about New Acland at newhopegroup.com.au.